In 1942 with the shutdown of private construction during the war Richard accepted a position as visiting professor at Bennington College in Vermont and as design consultant for schools and hospitals in the island of Puerto Rico. Dione and their then four-year-old son Raymond accompanied him. 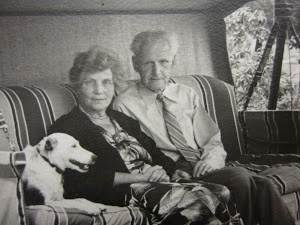 Dione's parents, Alfred and Lilly Niedermann, came from their apartment in Westwood to live in the Neutra compound and take care of Dion, then a high school student, and Frank. A few years later in 1946 they returned again for a few months while the Neutras were on a state department sponsored tour of South America. Between 1948 and 1955 Dione's younger sister Regula Niedermann Thorston (later Fybel) worked as the manager and interior decorator of the Neutra office and lived at the Neutra compound as part of the extended family. She came to this position after WW II where as a nurse she had served as Captain in the US Army and as chief nurse of a field hospital and then a translator in the War Crimes Commission. She used her interpersonal and organizational skills to guide the office during a busy time in the early 1950s. Ultimately she left to take up a career in real estate. Raymond wrote a remembrance of his aunt after her death in 1992, titled "Elegy for Regula."